Oh how I miss TGF! I'm seriously addicted to the style of stamps the make. The kids are sooooo adorable with their huge heads and cute expressions. Then there Anya, oh sweet Anya. I just love The Greeting Farm! I have recently begun taking coloring classes from Kit and Clowder, I must say they are worth every dime! I can't wait to take more! I used SU! Papers and flowers I got from Michael's Craft store, I color with Spectrum Noir markers. After a few cups of coffee and lots of snail adhesive this is my entry into the Farm Fresh Friday Challenge. Now I'll cross my fingers and hope my name is called, so I can adopt more TGF kids. Ha ha ha! She is so sassy!!! 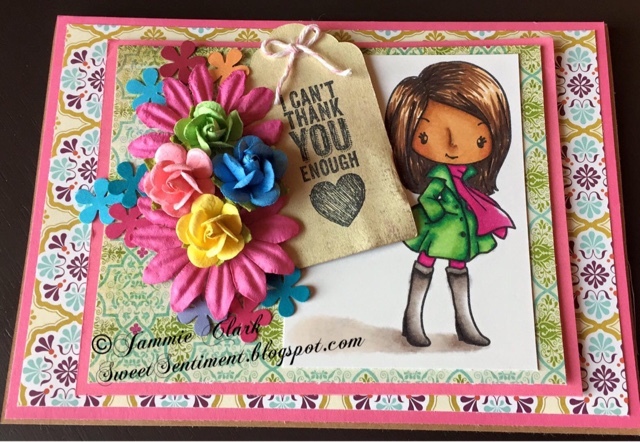 I love this girly card!! Thanks for joining us at TGF! !